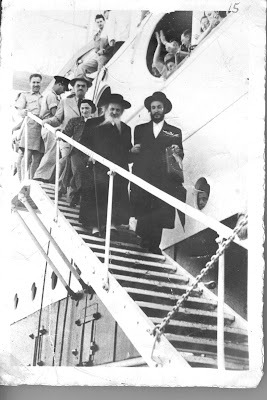 This being ערב September 1st, 70 years since the beginning of the destruction of Jewish Europe, I figured it a good time to share with you some pictures in the Tent's archives. Pictures of a bygone era and bygone people, murdered and destroyed by the marauders, among so may others. 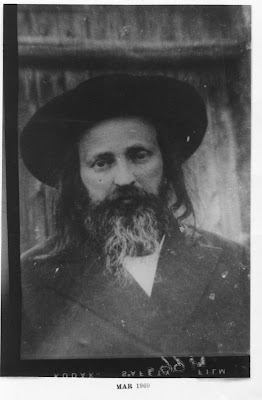 We have here - for your viewing pleasure - pictures of Reb Dovid Ahron Tverski HY"D of Zhorik, Poland. 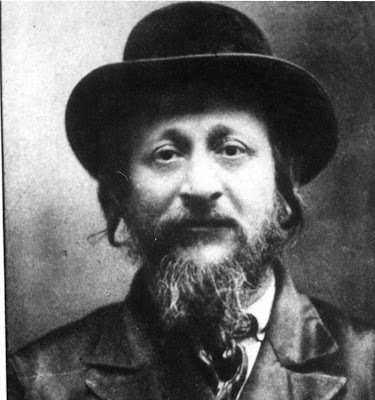 RDL was the paternal grandson of the Trisker Maggid, a son of Reb Yaakov Leib, Trisker Rebbe of Kovel. 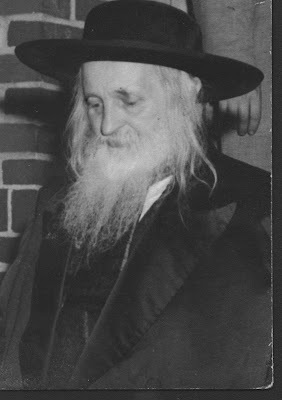 He also was a maternal grandson of Reb Yochonon of Rachmistrivke, brother of the Trisker Maggid. 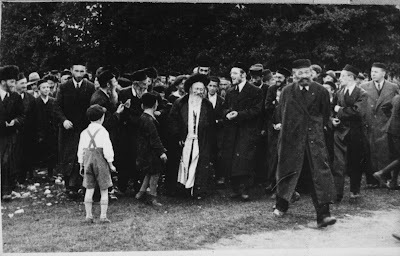 Two portraits and one snapshot of the Rebbe walking with a crowd on a festive day. 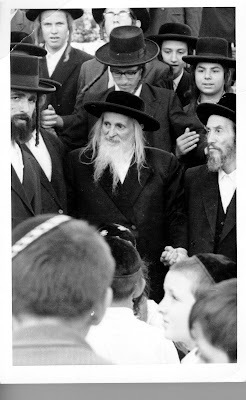 The Belzer like to "tcheppe" the "mordim/Machnovker" by calling them "Zhoriker," because the old Machnovker Rebbe, zt"l, uncle of the current Rebbe, was ( I believe) a son in law of the Zhoriker... The Zhoriker's Yohrtzeit is 11 Menachem Av, (5701) same as Reb Hillel Paritcher. Necktie keMinhag Chernobel... Only recently did Chernobel become synonymous with extremism in levush etc. 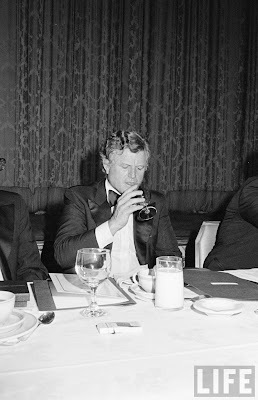 I'm surprised that some of you were surprised by comments regarding the death of the good Senator Edward Kennedy z"l. Here's why: It seems like these days, what was common and normal just a few short years ago no longer is that way. I'm talking mindset here. What we think and believe. Maybe it's the blogs that changed some peoples' way of thinking. 20 years ago, definitely in the years before, Jews believed that Society should be somewhat moral, since society affects our surroundings, and we all are products of our surroundings. Azoy vi es Kristelt zich azoi Yiddelt zich, goes the old saying, and we prayed that the Kristelling would not be too harsh. 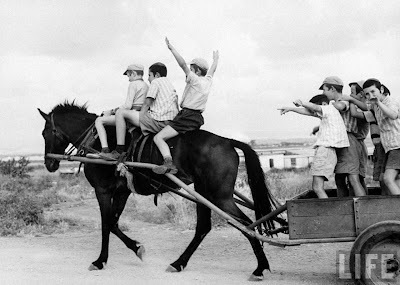 We hoped that the goy would not totally lose his marbles so that our children would be able to grow like want them to. Which is what happened, unfortunately. Lots of what we see today is based on the fact that we relied on society too much. We hoped that since our surroundings are decent that we could raise a normal Jewish family here in the enlightened world. 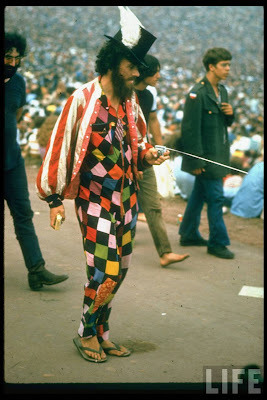 Then when society went haywire we suffered. You can say "not me," "not my group!" but that wouldn't be very truthful, if you look just a bit below the surface. So what were we supposed to do? How were we supposed to stand up to that massive influence? Funny you should ask that. One of the ways we were told was to vote for those purport to hold similar views on issues of morality. I say "purport" because one never knows. If the man says he'll vote against Gay Marriage or he'll try and negative keep influences out of our neighborhoods, or he'll vote to allow school vouchers to become a reality despite the unions, we vote for him, at least on a local level. (See? I fell into that Government handout trap...) At least that's the way it is/was in some circles. People like Rav Avigdor Miller would often tell their people that the dangers to our morals are what's most important, and that's what we need to vote to avoid. Why? very simple. 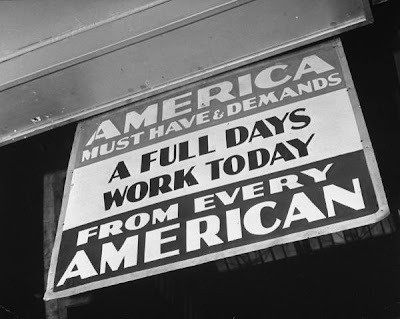 We didn't look to the Government to provide for us, we did that ourselves by working hard. The Government was there for other reasons. To pay taxes, collect social security - after all, you were just collecting what you paid in, and to fight wars, maybe. So the only question was how the Government was going to decide on issues regarding values. Years ago there was no different mindset against any of the Ultra-Orthodox, at least I don't think so. Then something happened amongst a certain segment of our society, and it started to adapt the sentiments of some of the "underprivileged and disenfranchised elements." 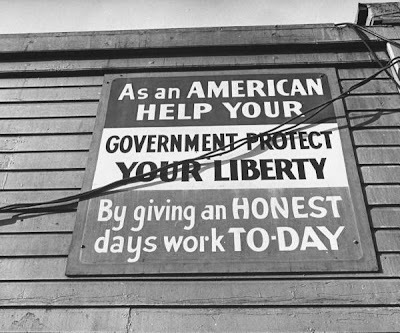 The Government was here to provide for us, and we were to take full advantage of it. פארוואס זאלען נאר די שווארצע און פארטיריקער קריגען? became the cry of the day. It's a malchus shel chesed, darf men oysnutzen di chesed biz vifil m'ken. We won't discuss the merits or lack thereof of taking Government assistance because that often depends on the situation, and whether or not the person feels any lack of pride by taking it on a constant basis. But we will discuss whether or not this has become the tafkid (aka role) of the Government! In some circles it has, and this all that matters, since di medinah zol farzinken verren, and voos geit mir ohn voos der sheygetz tut bay zich in tzimmer... Take that out of the equation and all you have left is: "Is he good for the Jews?" VeDal. That's why for the last decade or two you've seen a major shift in those neighborhoods, why Monroe voted Cuomo, and why Skver voted Clinton vs. Lazio, and so on. Not money for Yeshivos as much as money for my pocket. That's why guys like UD, a Commie like nobody's business, like Teddy Kennedy. Even the AI had the decency to say that they didn't always agree with him, that there were differences on social issues etc. It wasn't ALL about the "Benjamins." There's a lot more to say. But that's why I'm surprised. Ted Kennedy died last night. I only found out this morning. Turned in early last night. What can I say; the press is tripping over its shoelaces trying to make some kind of saint out of him. Some sort of Camelot they make of him, when he was something of a bully who pushed his policies on the poor and middle class whites. 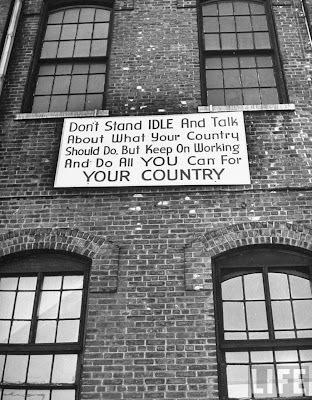 Like immigration, for instance. He never had to worry about the masses from Asia and Africa coming into his neighborhood, he lived in very exclusive neighborhoods, where those dirty, colored people could never dream of living. It was the blue collars who had their neighborhoods destroyed and their jobs taken. 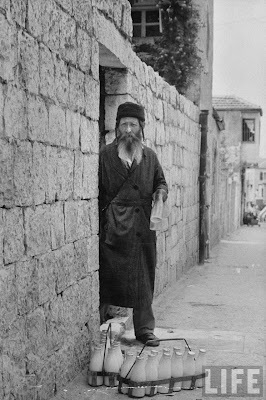 It was the Jewish neighborhoods that quickly emptied out, not the Palm Beach compounds, nor the Hyannisports of the world. No Asian ever did anything more than serve him his many drinks, and no African ever came close, unless he shone his shoes or served him more, hiccup, drinks. There are times when politics or other reasons create strange bedfellows. Nothing has proven that point more than the case of PETA and all that's evil in this world VS. the Rubashkin family, a symbol of good. 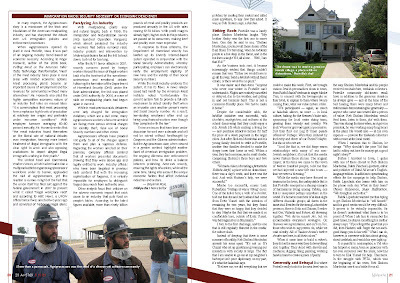 We've spoken here often about how Pinchus Lipschutz of the Yated has been at the forefront - quite literally - of the effort to save SMRubashkin from years in a federal penitentiary. You might even say that he's been more vocal, helpful and supportive than many of his co-Chassidim members, if you know what I mean. Besser's approach seems to be to interview Sholom Mordechai and show him as a family man, a chassidisher yid and a true Ba'al Chesed. Not some ruthless robber baron who also happens to throw some money around just to have his name on buildings, and Rebbes visiting his home and partaking of some of that delicious fruit heaped in huge silver bowls. I don't think Besser is a lawyer, but an approach like that using character witnesses and such, should help in the upcoming trial, and is no different than what the Tzad HaSheni is doing, namely generalizing, using stereotypes and other such means of winning a conviction in the court of public opinion. 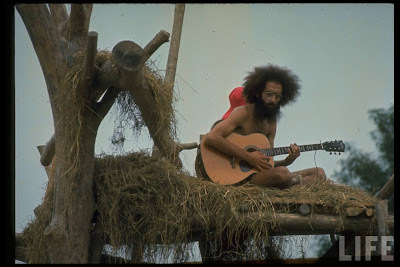 You might say Postville will be Judenrein - as far as institutions and families go - once the Friedman regime takes over. That's sad. I'm sure some of the locals would like that, despite the knock on their economy. Gone is the noble cause, and say hello to business as usual. Shochtim flying back and forth, away from their families all week. In Mifflintown the trip is done by car, and the terrible storms in the NorthEast are few and far between. So the shochtim to Empire - and now Scranton - are pretty much guaranteed to be back on the job. But what happens when they get those nasty storms in the Midwest and the Shochtim are stuck in Chicago or in Minneapolis waiting two days for the runways to be operational again? This does not bode well for the Kosher meat and poultry consumer. Was that part of the buying decisions for the Friedmans? Then again, he's made money - and still is - hand over fist, while I worry about the grocery bill come Thursday... So I guess he MUST know what he's doing. 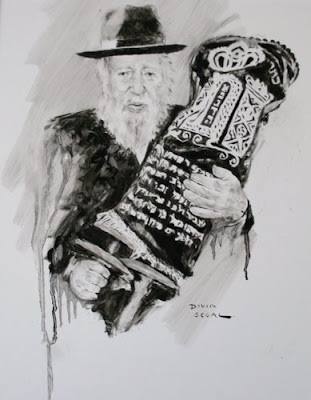 Also, the zechus of having his name of BME here in Monsey, and the zechus of having his name on the Oz VeHodor Gemoros, will SURELY stand at his side and help him in any future ventures, no? But one thing's for sure: Gone is the ideal of getting kosher meat and poultry to the consumer at a very reasonable price. It's all business from hereon in. Oz VeHodor isn't cheap and neither will this. It's a challenge, a game, something you do on a whim because life is boring just counting money, and the nursing homes, plastic and real estate businesses are tough on a man. You need new and exciting things. So you decide it would be fun to get your hands dirty and get into the chicken business. The fact that he never held an uncooked piece of chicken in his manicured hand makes no difference. He's got the Midas touch, he's a Magyar ember, he knows how to make Kesh-Gelt (Peynz) like in di alte heim. So why not makes some serious cash on the backs of the masses? We've talked about this before. Prices are through the roof. The other companies will be only too happy to keep them that way now that Rubashkin is out of the picture. And the fools will think that they're getting better and more kosher meat, so they'll pay the crazy prices. Hahahaha. Bekitzer, we're all in for it. Did I go too far in projecting all kinds of terrible things for the future of Kosher meat? maybe. After all, I don't know the Friedmans, I don't REALLY know what the Rubashkins did or didn't do, and I have no idea what anybody's plans are for Postville and its Jews. But I have feelings too. Just like every other 2-bit mayvin out there, and I have just as much right to my opinions and projections as they do. 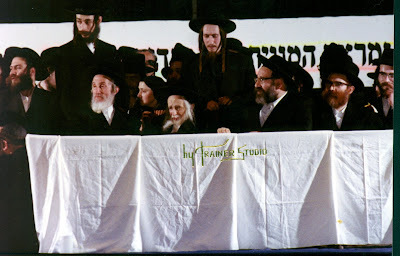 This being Chodesh Elul even in the Chabad calendar, I do ask mechillah if I offended anybody or was Motzi Shem Ra on any particular family, but from the interviews that HF gave to the Haredi press after his purchase of Agri it seemed liked he'll do everything he can to uproot any remnant of Rubashkin or what he built with his sweat and tears. Not that it should come as a surprise; he doesn't see things any different than any other shlacht-hoyz, they don't build shtetlach, neither does he. But here there was one, why the need to change things? 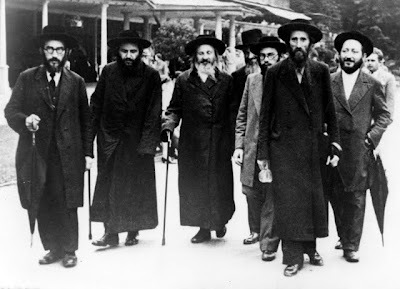 Reb Schneur Zalman ben Reb Menachem Mendel ben Reb Levi Yitzchok ben Reb Baruch Shalom ben Admu"r HaTzemach Tzedek, N"E.
There are two efforts going on now in the Jewish world - or at least they were when I started writing this post a few weeks ago. 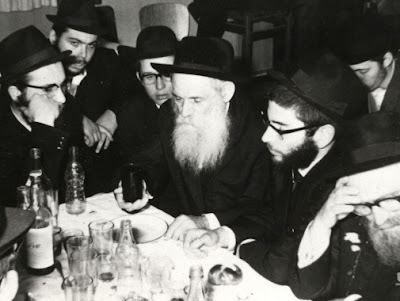 One is to get Canaris the status of Righteous Gentile, and the other is to get Rav Zalman Schneersohn, first cousin of Reb Levik, the Rebbe's father, recognized for his rescue efforts during WW2, when many, many young Jews were saved (and kept frum!) from certain death. 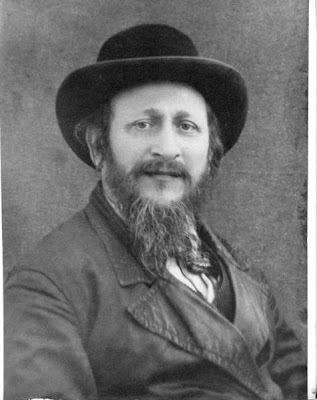 AFAIK the Canaris effort is the efforts of one Yosef Yitzchok Kamenecki, amateur historian, who got involved in the matter when BMR's book was translated to Hebrew, which was then followed by another book in Israel by another author. 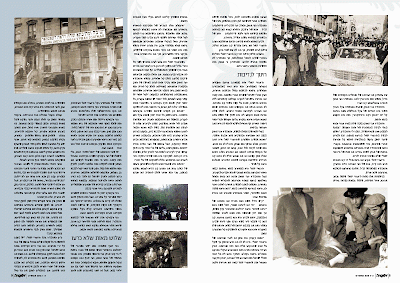 YYK was interviwed by Israeli TV numerous times, as the press there thought they had a real expose' on their hands. I guess he thought, with him being in Israel, that he'd show true haKoras haTov in the name of the worldwide Chabad-Lubavitch movement, and lobby Yad Vashem to make him some sort of righteous gentile there. 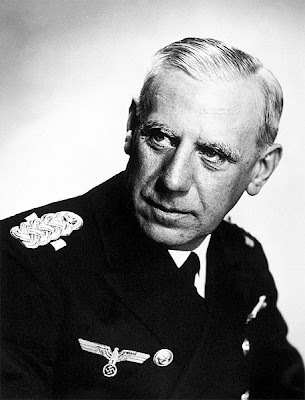 It seems like that idea didn't fly in the Holy Land, seemingly because of Canaris' being in the Nazi hierarchy he must've been in on some of the other decisions by the Nazi regime, namely the mass murder stuff. And not only that; but now that the story was revealed, and somebody wants to do something to show appreciation, and they're told that what they're doing is selfish, because he only saved the FR, or him and a few others, so that doesn't warrant recognizing his good deeds. 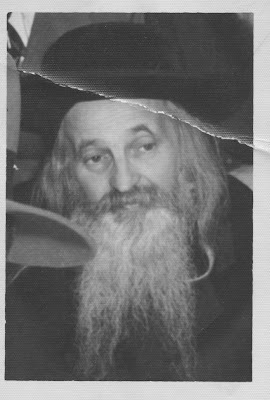 As far as Reb Zalman Schneerson goes; His rescue work is legendary among Chabad. 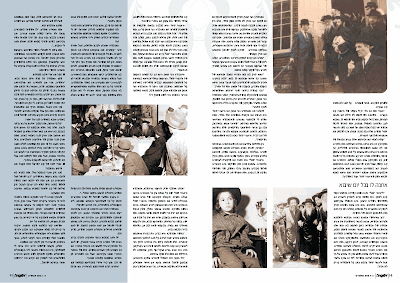 There are many, many families in Chabad today that owed their lives to him, since he rescued the zeide or Bubbe, and gave them a genuine, Yiddishe/Chassidishe education in France. 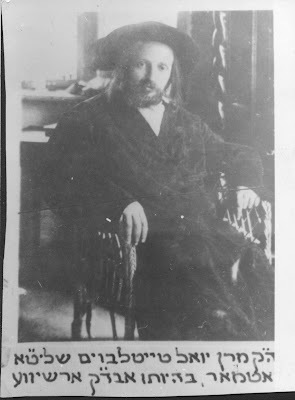 Reb Zalman's son in law was Reb Eli Chaim Carlebach, noted author and Rov of the Carlebach shul, and recently there was a symposium at that shul about Jews saving Jews. It seems like YV only honors non-Jews who saved Jews... and they're trying to do something about it at the Carlebach Shul. You might say they're only doing it because he's the Rav's - Naftoli Citron's - great grandfather, but then again, someone like you would find ulterior motives for any good deed or project. So here's a double no-win situation. 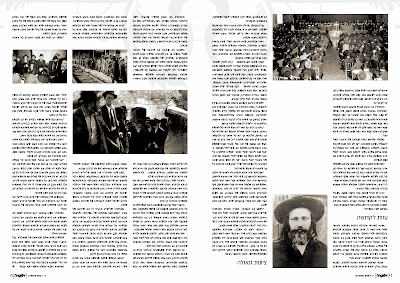 Wiesenthal Center says that Chabad is practicing "particularism" by wanting to honor Canaris, and others say that Jews saving Jews is nothing, and therefore unworthy of praise. Or you just might say "who cares what they think?" but the story must be told either way. About Reb Zalman, I mean. Sometimes a comment deserves to be "mined" not for length of comment, but rather for its on-the-mark points. This is one of those comments. Quick, to the point, and, best of all, in a lip-smacking Yiddish that would make the old times proud. Abarbanel has shown us his talents before, and here he does not disappoint. בימי חורפי, ביי אַ פֿאַברענג אין ירושלים התחיל זקן א´ לפזם התנועה עסען עסט זיך וכו´ אין מעי המו בקרבי מיינע קישקעס האָבן זיך גענומען דרייען ע"פ פשט ממש און די אַלע אַפּעטיטלעכע פּאָטראַוועס האָבן מיר פשוט גענומען איבּלען..
Music - Real Music - you can listen to! I'm not Chaim Rubin, nor am I Jewish Music Review, Jewish Music Report, Shlager, or whatever the music review sites are called, but I do like neginah. Real neginah, that is. Not synthesized Yamaha music with Jewish words added to them. Nor do I care for Broadway tunes gone Jewish. You all knew that, right? After all, it's in my profile. But I am "crazy" for Nigunei Chabad, in any form really, but when they're arranged using beautiful AUTHENTIC music then it's pure pleasure. Zalman G did a nice job choosing songs; some very famous, some tier 2 as far as famous goes, and some pretty obscure, like the "Ech Di Doo Da" on track 11. Getting Chilik Frank, number two Clarinetist after Andy Statman, (in my very humble unprofessional opinion) also adds a very professional dimension to the CD, and tells us how serious ZG is about producing good music. In these days of garbage (excuse my French) music performed by less than stellar characters, ZG's latest production is a beacon of light in these dark times of music. We all wish him much luck and success. I was a child, yes, but I was there, amongst the thousands, on the 26th of Av, 5739. I held on to my father's hand for dear life. 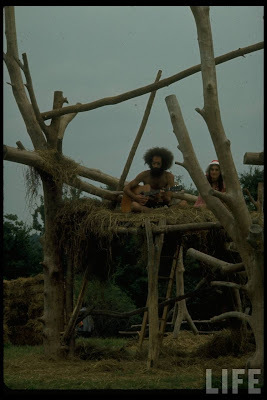 My older brother managed to get onto he porch of the Groyse BesMedrish, I wonder how much of it he remembers. We didn't need to travel far; we were in the country just up the road, but I imagine my father would've gone anyway, even taken off a day of work and traveled from Brooklyn if need be. There were hours and hours of hespedim, but I can't recall how long we stayed. VosIzNeias, in their coverage, have this very silly obituary, where they basically single out many of what were the Rebbetzin's accomplishments - such as Bikur Cholim and Hatzoloh - as what made him great. They just about miss the point, as usual. But they do have a link to some really great pictures, and they were nice enough not to kill the pictures by plastering their logo and emblems all over them, like that other site did, as if they were their pictures... Maybe if I was a bit more spontaneous I would've made the short trip from Monsey today. 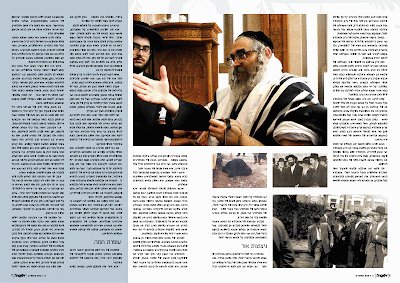 All day yesterday I was thinking about what I had seen in the book "שקיעת החמה" that was printed after his passing, where they bring a clip of the Algemeiner Journal, where he speaks about the fact that the "Rebbe hut nuch gebentshed Rosh Chodesh nechten bam Oomid." I was thinking that here we are 30 years later. Man! How the world has changed! Final days - 21 Kislev, maybe? 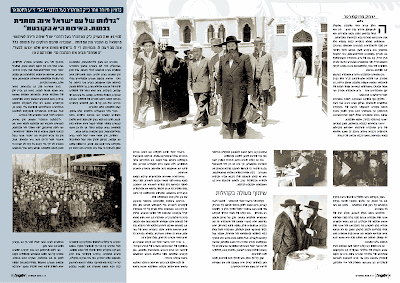 All the Jewish papers are full of the coverage, each trying to outdo the other when it comes to lekking Satmar. The Hebrew and the English ones; there's no refuge. And the silly way of referring to him: "The Divrei Yoel," is even more annoying. Nobody ever did or will call him that. What does someone like me do this Shabbos? HELP!!! Please bring 'em on fast and furious! Don't let up until you have expended all ammunition regarding this issue of the "Queen Elizabeth" standard of living we have been forced into by the "heimishe" chandelier -> breakfront -> leather couch -> black SUV -> matching clothing -> beheime fleish -> hoieche shtraamell mit a kroin -> winterized summer home -> breite kiddish -> silver vase -> vort, barmitzvah, sheva brooches, shloishim seedeh, fres-fests w/props and party planner -> Ateres Buckingham Palace wedding hall crowd. The list is endless... Not to mention the "religiously" oriented obsessive spending. The grossly bloated and bepatchkete 925 oversized Menoires, esrig pishkes, megille halters, zalts meistlech, napkin holders, besuumem pishkes, atooores (Shabbes, in far di vochentug) alles lekuved Shabbes!!! The echt leiderne antique covered siddeeerem, machzoirem, ketoires on klaf , chuusen shassen, tzenerenas, seleeches, (look out for the new leather kinnus) All in the name of the almighty G-d. Forget about the housing issue including home furniture, lighting, staircases, doors, decarative hardware and seforim shranks. I don't even know where to start. Are BP, CH, KJ, Lkwd and Willy "America?" Regarding the prices on goods and services within the heimishe community; Firstly, given the above mentioned "breite" standard of living, every shop owner or fachman starts out with the premise that you need to become rich from selling anything, otherwise there is no point in trying, no such thing as trying to "make an average living". So he needs to milk the consumer to the max. Whether it's a jewelry store or a shoe store, dress shop or seforim store, hat store or dry goods, a car dealer or electronics, the mikveh yid or the plumber, kid's tutor or mechanic etc. etc. aleh derfen shein ferdeenen. Forget about the quality of the product, or the reliability of the services, not to mention friendly courteous service; those are non-issues in competition the hatzloche depends on the cutthroat and nasty "take it or leave it" "ich hub besers voos tzi teen" attitude you convey to your fellow Yid. Ver ret noch when dealing with a temimes'digeh mother of ten whose husband struggles just to pay the mortgage - just ignore her or sell her the seconds, "tax free". Out of the coffee rooms! There are many items which without which it's poshut impossible to be Jewish. For instance: Black velvet/felt hats - in the rain, leather dress shoes in the snow, 100% polyester (zaadeneh) beckishes in the hot summer, Tall shtreimlech to dance at hakoofes, Custom Sheitlach (for the less-frum) when taking the baby to the doctor r"l, designer hats (for the echt frimme) when going to the fish store, diamond earrings when going to the dentist and last but not least Italian shoes when taking the kids to the hair dresser. Or food: overnight kigel, matyash herring by the .001 oz, or 4.5 oz. containers of Arbes, 98% Mayonnaise - egg, tuna, dill, olive, spinach, whitefish and lox dips, Express tuna-less sandwiches, zero trans fat rugelach (best in the entire country), overstuffed pastrami flavored filling sandwiches, and yes, LIGHT grape juice. Hello! Any accountability out there? Der oilem is hingerig! Royal Shoes, Malchus Suits, Kesser Hats, Queen's Boutique. Oh! I forgot Royal Linen, Royal Furniture, Royal Kitchens, Royal Doors, etc. The obsession with these types of names says alot about the mentality of the consumer. We have gone totally crazy, and I shudder when thinking what will need to happen in order to bring us back to a sane, logical, economically-sound way of life. PLEASE SOUND THE ALARM! KEEP THIS ISSUE ON THE FRONT BURNER UNTIL EVERYONE COMES TO THEIR SENSES! May everyone be gebentched mit asach parnooseh bekooved. P.S I am out of breath, as you can tell. We touched on the issue of educating our children last time, and it may have seemed to you like I was singling out Mosdos, somewhat unfairly. Mosdos are not getting rich off of us, at least not most of them. They're for the most part collecting what they need to have just to stay alive. It's just that what happens more often these days is that the fund raising aspect of it has gone by the wayside; Mosdos are tired of fund raising all the time for your child, so they pass the costs on to the "consumer," for lack of a better term. We can nit pick and say that some people make a nice living off of working in our schools, but for the most part that isn't true. Which means that the high cost of educating our kids is not the root of it all. We do go a bit overboard, with things like a year in Israel for 18 year-old girls at $14,000 a pop coming to mind, but let's not go there. Plenty of people never even get that far, meaning that their issues start way before they worry about tuition, they're still worrying about basic needs, like food and shelter, and they have no solutions, other than either sticking their hands out to GeMachim and such, or using the Government to the utmost. So, in trying to solve the problem here in the most upright and upstanding manner we need to introspect a little more. We like to point fingers at the Kosher food companies, the purveyors of meat and poultry, and what it costs to feed a family. A recent example of this really brought out the problem to me. On a trip to Pathamrk - No, not the one where I felt Golus - I noticed a large tray of chicken cutlets in a stand alone freezer, one of those without a top. It was a Perdue brand, IIRC. I check the price of this large tray and it was something like 7.15 for SIX POUNDS. 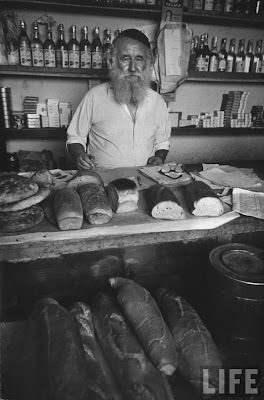 That same week I was in a Heimishe grocery, one where the more "frum" shop, and where they only sell the most HOLY hashgochos, like Hisachdus and Kiryas Joel, and a pound of the same chicken product was 6.19 PER POUND. So I ask you: what does the large family that shops there and wants "Ibbergetzoygene Baylig" once a week have to do to be able to afford 3 or 4 of those packages to feed their family supper? Either they can have it once a year after the tax refund check comes or they can never have it, because they don't want to have to spend fifty bucks on a supper. Or they can exhaust the food stamp budget and not have enough for Shabbos that week. Option 3 is to splurge and to "write down." אראפשרייבן בלע"ז. Every day twice, three times. The kids put things on the bill every day on the way to school. Before you know it the bill is at hundreds, if not thousands of dollars. There's no money to pay that kind of bill. Then the grocer can't pay his bills to his suppliers. Suppliers and distributors need to raise the prices just to raise the cash they need to stay afloat. And the vicious cycle goes on and on. Grocers in such areas - areas that can't be cash and carry only - cry and beg for people to pay their bills, but to no avail. People can't pay because they have no money, they have no money because they spend so much on.... You get the picture. Somehow when it comes to maintaining our lifestyle we suddenly become big believers. We believe that this can continue because G-d loves us so and won't let us down. OK. Fine. We also believe that G-d wants to wear only the finest clothes, even for our two and three year olds. 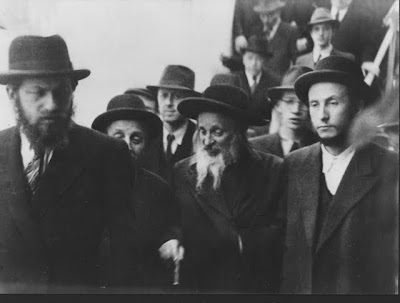 After all, does G-d want us to go to a department store where we see Goyim, chas Vesholom? of course not! And does G-d want us to be modest AND simple? of course NOT! so we need to shop locally and buy only Italy and France's best. 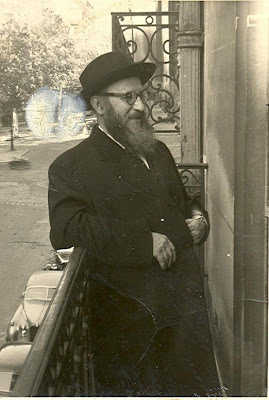 If hundreds of thousands of Jews never heard of him, never saw him, never asked him an Eitzah, or didn't make use of his hadrochoh, does that make him any less of a person, of an influence, of a mentor? UPDATE 8/5/09: Truth be told, I had no idea what the niftar's opinions were regarding Lubavitch, I was just asking the question. Meaning, if a person is based only on popularity and acceptance, where does that put Reb Zelig? 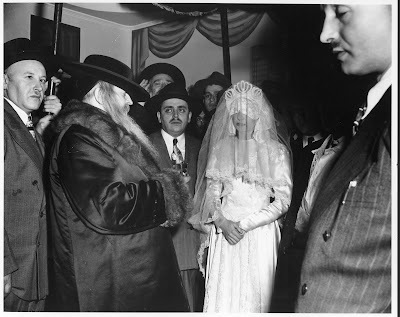 The one that was supposed to have been the Chochom, Tzaddik, and Gaon HaDor? Can't you people think for a second without inserting your fourth grade line of logic? !